Kimchi Family was the second Korean drama I ever watched. At the time, while I was knocked out of my socks at how wonderful it was, I didn’t appreciate how unique it was. It is romantic with out being a romance, filled with action without being action driven. Like many dramas it has its far fetched elements, yet there is a realness to the characters and relationships – even the restaurant, Heaven, Earth and Man feels like a real place, not an analog of something in the real world. The first episode has a lot going on as it introduces the main characters in the ensemble and sets up the three story arcs which span the series. First we meet Ki Ho Tae played by Song Il Kuk. Ho Tae is at a crossroads in his career at a gangster. 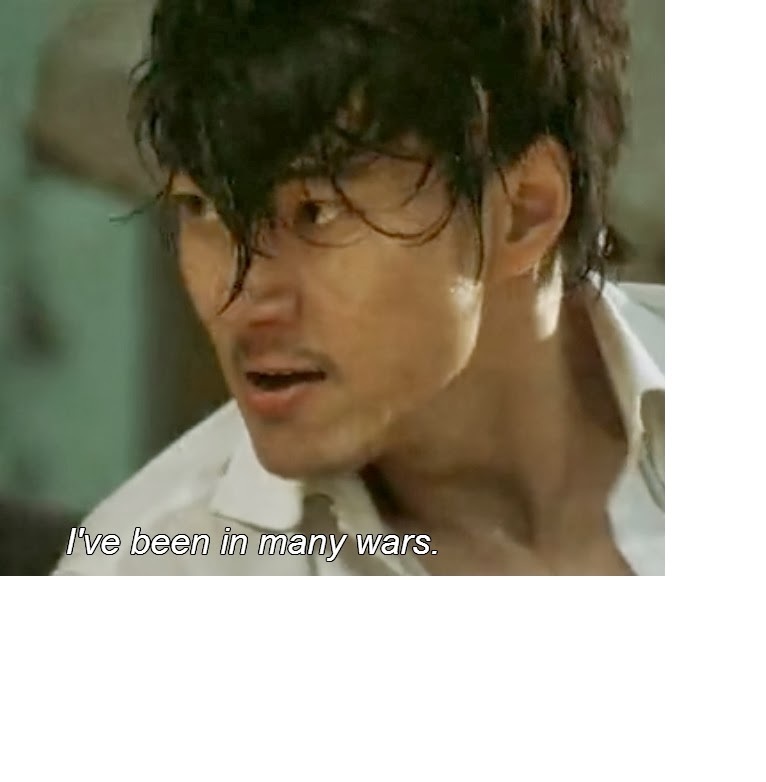 Ho Tae is a formidable opponent, as the opening scene demonstrates him beating down the members of his own gangster squad. He is filled with anger, impatient, and hungry. We see that his physical hunger, where in his refined palate detects the subtle flaws in every dish he eats, is a indicator of his spiritual hunger. Ho Tae is not irredeemable. He is, as our female lead says at one point, 2% redeemable. This is what get him in trouble with his gangster squad, he is not utterly ruthless. He saves the life and livelihood of one of the loan shark victims, which puts him at odds with his own gang. Ho Tae is number three in the gang. He is favored by the Big Boss who is hospitalized, and at loggerheads with the number two gangster, his immediate boss. Lee Kang San, played by Park Jin Hee. Kang San is a classically French trained chef who can’t quite leave her family’s traditional Korean restaurant behind. Kang San is fearless, rushing in to confront Ho Tae as he is leading off the delinquent lendee from the French restaurant where she is in charge of a line. She is also teachable, she defends her food but is flexible enough to correct the mistake Ho Tae points out. Kang San is also at a cross roads. The main French chef is leaving and, like Ho Tae, she is favored by the lead chef but not her immediate boss. She receives a call from her sister asking her to return home for their father’s birthday. Kang San’s family restaurant, Heaven, Earth and Man, is featured in a TV show. It is how we are introduced to the ensemble which is centered at the restaurant: Kang San’ older sister, Woo Joo, Grandpa Sul and Dr. Han, restaurant regulars, Do Sik, the secondary chef, Mr. Lee, Kang San’s father, and Eun Bi, a small girl fascinated by Mr. Lee and the welcome exuded by Heaven, Earth and Man. Ho Tae sees part of the TV special and it catches his attention. He travels to Heaven, Earth and Man and as he stands in front of it, we find he remembers coming there as a boy. Before he can explore further, Ho Tae is called away by his junior in the gang. Ho Tae has just sealed his fate. Ho Tae is not just hungry for food, he is hungry for warmth and human kindness. He is hungry for acceptance and family. Kang San comes from a long line of chefs whose calling is not just to feed the body, but to feed the soul. Like anyone with deep familial bonds, when faced with a crisis she retreats to the support of her family. It does not matter that she has been exasperated with them and trying to establish her own identity. Family is there for her. In Kang San’s response to Ho Tae we see the fruit of every relationship and every life lesson nurtured by her family. It is not enough for the Lee family to take the traveler on the road to Jericho to the hospital. No, these Good Samaritans take him home to tend his wounds. Ho Tae spends the next day at Heaven, Earth and Man joining the family table. It is a revelation. The food satiates the physical hunger, the familial love, the emotional hunger. He still is having flashbacks and resolves to ask Mr. Lee to shed light on the matter. Tensions are bared when a man tries to buy Heaven, Earth and Man. Mr. Lee and Ho Tae kick him out, but we learn that the restaurant is encumbered with debt, leaving it vulnerable to take over by a hostile group. Kang San and Woo Joo are at odds over the best course of action. Woo Joo is convinced that if Kang San came home and took over the restaurant it could be saved. Kang San wants to sell the restaurant. Mr. Lee asks Ho Tae to stay a few days. Ho Tae wakes the next morning determined to understand his flashbacks, but Mr. Lee has left, leaving a note for his daughters to resolve the dilemma on their own. Stymied, Ho Tae leaves, only to be told to stay hidden by his junior in the gang. Ho Tae must keep low until the Big Boss leaves the hospital. Kang San resolves to leave Heaven, Earth and Man only to find out from her junior that she was replaced at the restaurant by her immediate boss, once the French chef who had groomed her left the country. I don’t know if you have ever had the experience that Ki Ho Tae has had: of finding your needs graciously and humbly met. Undeservedly, unexpectedly, but in that aha! HERE it is moment. Those moments are the moments that can change you, can correct your course through the sheer kindness of them if you are able to receive. Receiving is so much harder than giving if you feel unworthy to receive. Those that are unworthy to receive are the ones that most need a gift. Can you tell I love this drama? What was your favorite part? See you next Thursday for Episode 2. I loved Kimchi Family! Thank you for the great review, which I can share with friends whom I would like to introduce to Korean dramas. That sounds like a neat drama to watch. Pingback: Mind Your (table) Manners! – My feeble attempt to cook Korean.